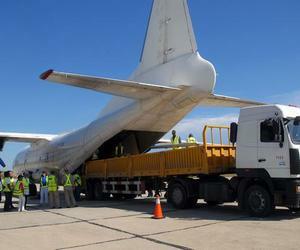 An airplane financed by the World Food Program (WFP) arrived on Thursday at this city’s Antonio Maceo International Airport with the first international help received from this organization for the victims of Hurricane Matthew. Laura Melo, WFP representative to Cuba, said that the cargo consist of temporary warehouses, which will be of great help given the damages suffered by these buildings in Guantanamo province and the need to distribute food. Melo said that they also transport pills to chlorinate water, donated by the United Nations Children’s Fund (UNICEF). Also transported as part of the contribution of the WFP is one thousand tons of food pre-positioned in Cuba to damaged areas together with the government authorities of the Guantanamo territory, she pointed out. This commendable action is part of an operation of support that will take place over the next six months for the communities hit by the powerful hurricane, she added. The aircraft and its crew, arriving from the Republic of Panama, were received by Mayra Perez, vice-president of the Provincial Defense Council in Santiago de Cuba for transport, and Maria Luisa Bueno, delegate for foreign trade and investment in the province. The operation of the WFP seeks to strengthen logistic capabilities in these territories, also with the delivery of trucks and cooking devices, according to a communique by that institution. Likewise, it includes the delivery of fortified cereal, composed of corn and soy, for pregnant women, and powder micronutrients for children between 12 and 23 months old, in order to increase the nutritional value of their daily diet.